Citing what she called the “historical lack of political will to respond adequately to the urgent and dire acceleration of global warming,” a judge in Washington state handed a group of eight young petitioners a landmark win this week, ordering the Department of Ecology (ECY) to consider statewide reductions in carbon dioxide emissions based on best available science. “The effect of this decision is that for the first time in the United States, a court of law has ordered a state agency to consider the most current and best available climate science when deciding to regulate carbon dioxide emissions,” said Andrea Rodgers of the Western Environmental Law Center, attorney for the youth petitioners, who are in elementary, middle, and high school. 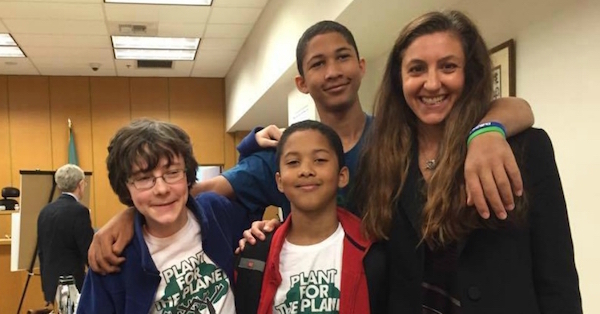 The kids acted with the help of a NASA climate scientist as well as Our Children’s Trust, an Oregon-based nonprofit orchestrating a global, youth-driven legal campaign to establish the right to a healthy atmosphere and stable climate.